As someone who reviews gadgets, I constantly receive and ship packages through different carriers. Although I receive email updates from couriers including DHL, Fedex, UPS, and USPS, I’ve always been looking for a convenient tool to track all of them with my iPhone. 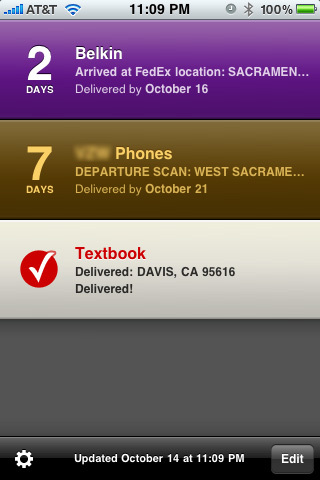 After messing with many Apps, I finally came across one that works: Delivery Status Touch by Junecloud. After grabbing the Delivery Status Touch from the iTunes App Store, it’s quite easy to start using. Just tap the Edit button, and click the ‘+’ icon to add a new item to track. Just about every major domestic delivery service I’ve used was listed and there are quite a few international ones as well. There’s even tracking tools for Amazon, Apple, and Google Checkout orders. Once you choose the service, you’ll have to key in the tracking number and pick a name. Fortunately since the iPhone now has copy and paste, it’s quite simple to grab the code from an email and enter it into this App. Although it might be overkill, I would truly be impressed if they added Optical Character Recognition (OCR) for use with the Camera. I would love to be able to just take a snap of the tracking number on a sheet of paper. 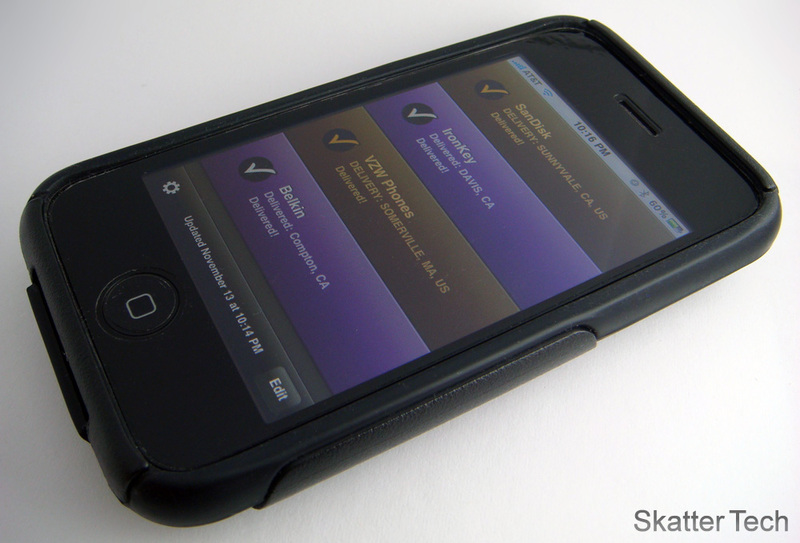 The home screen will display a list of the active packages you are tracking. You can manually sort them or have it automatically organized by delivery dates. 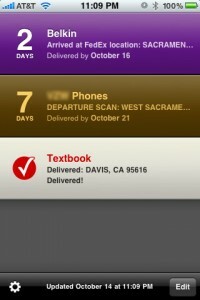 Each item updates each time the App is started and will display the number of days until delivery besides each app. 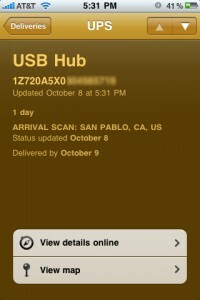 There’s also a one-line message of the latest status provided by the carrier and the estimated delivery date. Once delivered, the countdown will be replaced with a check mark. The items are also color coded by each company’s most prominent color. You can click on an item for further details. The map link will display the last known location of the package and your current GPS location. The entire Delivery Status Touch App has a landscape mode and there’s even a Junecloud web page to sync tracking numbers. The application is quite responsive, well polished, and easy to use. The only feature that’s missing that I would love to see in a future version is Push Notifications for deliveries, exceptions, or even progress updates. 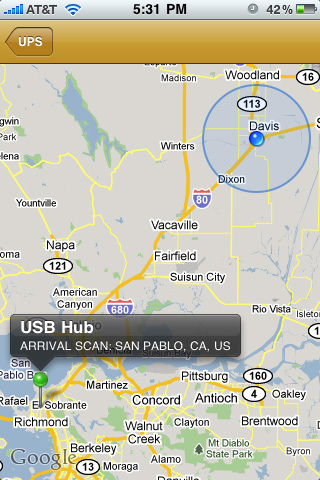 There’s plenty of ways to track packages on the iPhone, however none are as well designed as this. If you rarely track packages, you can probably survive just fine using email updates and using the browser to check on packages. On the other hand if you are always have a number of shipments going in and out, this is an excellent tool to stay organized. It’s available for just $3 from the iTunes App Store. Posted Lite on the App Store has OCR barcode recognition and push notifications. It also supports heaps of shipping companies from around the world. Not quite as good looking as Delivery Status Touch though, but its certainly not bad by any means.